Accidents involving commercial trucks are significantly different from other motor vehicle collision cases. Trucks that travel across state lines are governed by Federal Motor Carrier Safety regulations which require certain insurance coverages, business practices, records and documents that are unfamiliar to most attorneys. And considering the catastrophic injuries and consequences that are typically associated with interstate truck collisions, retaining an experienced attorney immediately is essential. Traffic fatalities are a frequent and common occurrence when a collision involves a tractor trailer. The size, weight and speed of the truck are significant contributing factors to serious injuries and death. And majority of the deaths occur to the occupants of the other vehicles, instead of the truck driver. 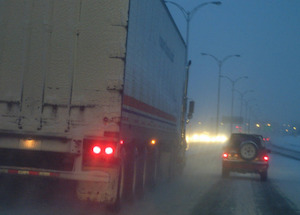 Commercial truck drivers who drive across the country are at times fatigued and/or sleepy. They are often attempting to meet a deadline and reach their destinations in the shortest period of time allowed by law. Trucks are often overloaded or not loaded properly. The trucks are oversized and often poorly maintained. The truck driver may not be as experienced which is often a contributing factor when traveling too close, attempting to maneuver through traffic, changing lanes in an unsafe manner, etc. And then there are often other factors such as driving under the influence of alcohol or drugs. Additionally, the truck may not have been properly maintained as to safefty systems, lights, proper mirror placement, warning devices, etc. Accordingly, it is imperative that an experienced trucking accident lawyer is retained immediately to demand that the trucking company preserve the evidence and documentation to properly pursue damages in the event of personal injury or wrongful death. If you or a loved one has been involved in an accident with a commercial truck, call us immediately to aggressively pursue your claim against the large trucking company. When results matter, call Trial Lawyers USA, LLC, (678) 882-7355.